Video also shows the basic principles of power transmission using capacitive coupling. 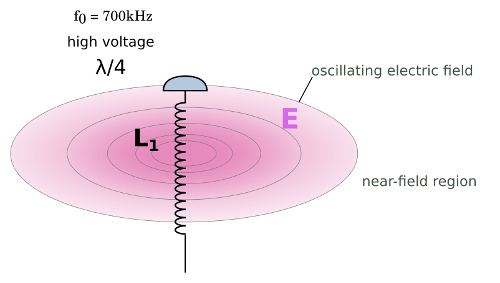 High voltage, which generates a Tesla coil, also generates a strong oscillating electric field. 2. Inductive or capacitive coupling ? The strong electric field enables a strong capacitive coupling and higher power transmission. Inductive coupling is negligible. In both cases (a, b) bulb glows with the same intensity, no significant differences. a) The bulb does not light up – potential V1 = V2. b) The bulb does light up – potential V1 > V2.